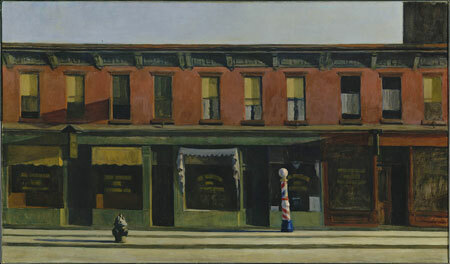 Visualize along with me: today, have a look at some straight ahead architectural works by Hopper. Tomorrow, I'll post the figure in interior works, and I want you to ask yourself whether the figures feel added into the architecture, or whether they've been worked into the whole cloth of the painting. I'm forming a thesis, likely incorrect, that some of the figures seem awkward not becuase (or not only because) of the usual complaints about their anatomy, but because they don't strictly need to be there from a formal standpoint. It's probaly heresy to suggest it, but I generally find figural works by Corot to come off awkwardly, especially when compared to the bullseye certainty of his straight landscapes. That doesn't always make his landscapes superior, but I notice the tension - I get the sense that he could have painted little views of Rome all day with great pleasure, while his renditions of women, however loving, were at least somewhat of a pain in the neck for him. 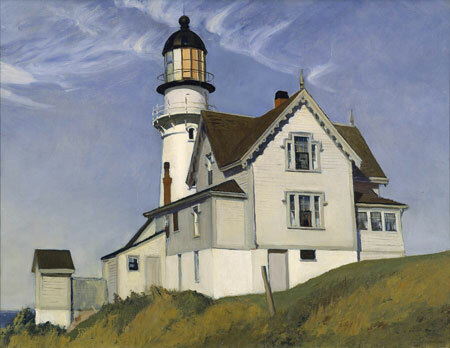 I'm going to suggest that the same was the case for Hopper - that he would rather be painting urban landscapes, but if any human drama was going to unfold inside the interiors, there had to be some goddamn humans in the picture. In the meantime, these just coalesce like a good jazz ballad. I lightly homaged Early Sunday Morning. Well, the hydrant. The hydrant and barbershop pole in Early Sunday Morning feel decidedly anthropomorphic, and yes, less than necessary as well (although it would be good to have something in foreground). 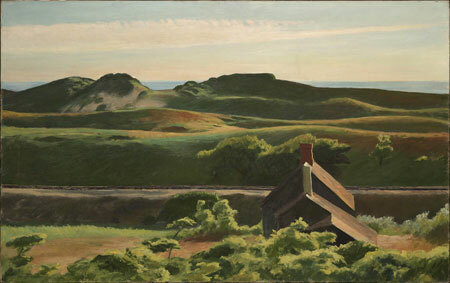 Nuance abounds in Hopper & Corot. Interesting that you say that, Arthur. I has seen the painting a couple of times but this time I realized how vital the fire hydrant and the barber pole are to the picture. Anthropomorphic, yes - virtually figurative, in fact. Without them the painting would be dead. This one of those rare things that you just can't see in reproduction.